Julia Chen made a very fast repeat of "Believe it or Not". 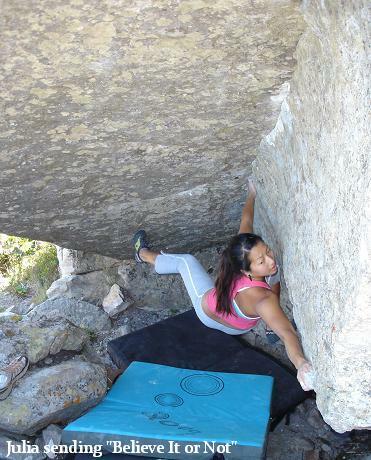 The problem has been tried by quite a few of the Cape boulders, with success only coming for a handful. The bizzare problem was originally opened at 7C+, but the grade is being debated as taller climbers have a much easier sequence than someone as short as Julia. Despite all this Julia reckons the problem isn't much harder than 7B, even if you do use the harder method.